Boston is more than baked beans, baseball and “Cheers”. Experiencing Boston means you stay in Boston, experience the friendly people who live here, eat their cuisine, and see history. Boston is the site of the infamous “Tea Party” a phrase everyone is aware of today. There’s so much to experience, making downtown Boston your hub is the way to go. Boston see’s a fair share of visitors all year long, but the best overall months to visit for reduced room rates is fall and winter months, September until March. Magic Savings Tip: Don’t rent a car, and purchase a Boston City Pass for not only public transportation, but also discounts at top attractions. Spend a few hours on the Freedom Trail walking tour, a 2.5-mile stretch and 16 sites, and see what the colonial wars and revolution was all about. Among the buildings are the home of Paul Revere and the Old North Church, site of the “two lanterns”. A great follow-up for the walk is a few hours in the Isabella Gardner Museum. Another visit in history is the JFK Museum and Library, set within a 10-acre “Public garden”, created in 1837 and the first botanical garden in the U.S.
Visit the original bar, the Bull and Finch Pub, now Cheers on Beacon Hill for a tall cool draft. Sit in one of the chairs the original cast members used while filming the hit series “Cheers”. Take the BeantownHop-On/Hop-Off Trolley Tour, and see Boston at its best. This guided tour takes you to many of Boston’s famous sites. Your twenty stops include MIT, Beacon Hill and the famous Cheers Pub. A visit to the New England Aquarium is a terrific way to get the kids some exercise and knowledge. An evening dinner cruise is a spectacular way to not only dine but see the city lights under the stars. Of course, a city with such old history, with witches and goblins, why not take the Ghost and Gravestone Tour of Boston. Don’t forget your cross and tracing paper with pencil to trace the words on your favorite gravestone. If you take that trip out to Provincetown, you must eat whole lobsters at the famous Lobster Pot. The top three restaurants for enjoying the best original and real clam chowder are, Island Creek Oyster Bar, James Hook & Co. and Ned Divines Irish Pub, really no joke. If you desire the best of the best Boston has to offer in fine dining and wine, look no further than L’Espalier located on Boylston Street. Here you will enjoy traditional French New England Cuisine. Enjoy a 3 or 5-course Prix Fixe dinner, or really go all out and reserve the Chef’s Table. Helpful advice, eating here means you don’t really care what you pay for the best of the best, and she’s worth every penny. Take a drive to Salem Mass and enter the land of witches is you dare. Purchase a Salem Passport from a Visitors Center, and visit the Salem Witch Museum, House of Seven Gables and Peabody Essex Museum. Visit all sites aboard the Salem Trolley and save gas money. Another excellent day trip is out to Cape Cod along the scenic highway. With so many little seafood shacks along the way, tourist shopping, beaches and viewing waypoints. On the way, stop in Hyannis and take a drive past the Kennedy Family Mansion is that’s part of history that is of interest. Another great place to visit out there is Woods Hole, a nautical experience for any sailor. To experience Boston to its fullest you need to be based in the middle of it all. The Element, Lexington is fantastic for a luxurious and convenient stay surrounded by some of the city's most well-known buildings and gathering spots. The Lenox Hotel puts you within walking distance of many of Boston's best parks. Similar to your dad, Boston also knows a lot of good bars, many of which are found in the downtown area. The Eliot Hotel is a boutique hotel that locates you centrally downtown, where some of the best shopping and food can be found. 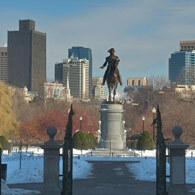 If you love the idea of a spectacular city in all its winter glory then Boston beckons. This place comes alive during the winter months as the locals gear up and make their city pretty for one and all. Some of the best activities are indoors and compulsive garage sale browsers, jewelry collectors, interior decorators and treasure-hunters of all kinds love the Cambridge Antique Market for its five floors of vintage and antique finds and its T-accessible location. Easy to get to, it's an absolute delight to explore for the morning then venture back out to enjoy more. The city warms up the nights with all things musical including some good dance clubs. Some of the best are at Cambridge’s Central Square which is turning into an unofficial Dance Party District. A far cry from the Top 40 club-banging hotspots on the other side of the river, the hodgepodge of offerings on a few choice blocks of Mass Ave cater to a wide variety of tastes. Check out Eastern European electro-club fare at the Middlesex Lounge. If you're a first time visitor to Boston, you'll no doubt want to hit the local highlights - and of those, there are plenty But first, go to Cheaprooms.com and find a great value Boston hotel room close to the downtown area. The best part about Boston is how close all the major attractions are to downtown. Find cheap accommodation in Boston and enjoy a closer look at a great city. Being a coastal city Boston offers plenty for anyone wanting to ahoy on the ocean blue. Climb aboard a whale watching cruise which sets out from Boston Harbor. Stellwagen's heavy concentration of humpback, finback, and minke whales guarantees an adventure filled with opportunities to view and learn about whales as they frolic close to your vessel. Jump on the Hop-on Hop-off Trolley Tour and see the city, its attractions and discover much of its history. The best part is you get to create your own itinerary as you hop on and off at any of the 18 stops as often as you like. Trolleys depart every 20 or 30 minutes. And if you do catch the Hop-on Hop-off Trolley, get off at stop 5, and visit the Old State House, Boston's preeminent historical museum. The museum's collection includes authentic artifacts chronicling Boston's history, all housed within the oldest surviving public building in Boston. Sometimes a great way to really see a city is to concentrate on one particular zone. In Boston, for instance, the waterfront area has a number of excellent attractions that will keep you interested for days. Go to Cheaprooms.com and find an great value Boston hotel room close to the downtown or financial districts area. By staying close to the waterfront hub, you're also relatively close to other major attractions like the Paul Revere House and the Boston Common area. 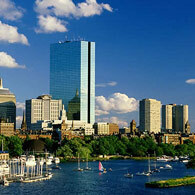 Find cheap accommodation in Boston now and spend money on your vacation not your accommodation. The Long Wharf was historically the busiest port in colonial America; a gateway for commercial traffic and the center of the city. These days is a cultural center and a people hub full of restaurants plus it's adjacent to the first of your 'must see's' in the waterfront area of Boston - the New England Aquarium. The Aquarium, on Central Wharf, includes the Simons IMAX Theatre and the New England Aquarium Whale Watch, which operates from April through November. The main attraction at the aquarium is the Giant Ocean Tank, a huge exhibit featuring a Caribbean coral reef. The tank houses sharks, sea turtles, stingrays, eels, barracuda, and much more - all of which can be seen up close, courtesy of the winding stairway that circles the giant tank and 52 windows. Look for the modern architecture on the Central Wharf and you've found the aquarium. 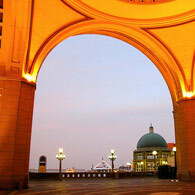 Rowes Wharf, further to the south, is a striking architectural statement; part hotel, part grand archway entrance to Boston, part cultural center. It's an area full of restaurants with a floating stage offering free concerts and movies during the summer. The area is a very pleasant place to stroll around on a summer's day. Walking is the best way to see Boston; those narrow, twisting streets might be a complete pest for motorists, but they're a complete joy for walkers! See Cheaprooms.com for quality hotels in the best locations of Boston. There are more than 250 hotels in Boston and many have weekend break packages that would suit couples. The central city area is very compact and takes about an hour to walk from end to end. There are good deals on Cheap Rooms and almost every location in the central area will suffice. Are you a fan of the seated statue of Abraham Lincoln in the presidential memorial in Washington? The sculptor was a gentleman by name of Daniel Chester French. French has a number of statues and designs on display in Boston, including the doors on the Dartmouth Street side of the Boston Public Library, the statue of John Harvard in Harvard Yard, and the Minute Man statue near the North Bridge in Concord. Start in the Boston Common area and enjoy the people-watching before exploring the Public Garden. Take a ride on the Swan Boats if you wish before setting off towards the corner of Charles and Beacon Sts. Still inside the Garden you'll see the 35 foot cobblestoned strip topped with Mrs Mallard and her babies - from Robert McCloskey's book. Cross the lagoon using the tiny suspension bridge and take a pic of the statue of George Washington, then make your way to the corner of Arlington Street and Commonwealth Avenue. You're now on Commonwealth Avenue Mall. This 8-block mall is the centerpiece of architect Arthur Gilman's design of the Back Bay. It's fabulous, 100 foot wide and just 240 feet long, and stretches to Kenmore Square past grandiose Victorian mansions, almost all divided into apartments or used as upmarket commercial premises or educational institutions. Boston is fun with kids! Travelling with small children just takes a little forethought, a little organisation and a little planning - like working out where, what and how you're going to participate in all the fabulous things your destination city offers. First thing to do is browse cheaprooms.com to find a child-friendly place to stay in Boston and plan your excursions from there. To experience Boston to its fullest - and not spend a great deal of downtime in getting there - choose somewhere very central. You'll find great hotels in the centre of Boston on our website. But you'll need to be quick - well-located properties book out fast. One of the most fun things to do in Boston is to take a ride on the Duck - an amphibious landing vehicle that takes on a wonderfully bizarre, informative and very different tour of Boston by water. You'll explore Boston from the Charles River - and they'll even let the kids 'drive' the Duck. Kids need food at regular intervals and parents need food that's inexpensive, healthy and in places that offer variety to cater for, shall we say, picky, tastes. Try the food court offerings at the Quincy Market in Faneuil Hall Marketplace. There are more than 50 stalls and the outdoor areas in summer are full of street performers to help your kids stay entertained while you enjoy a clam chowder or glass of wine. While we're talking ducks, take the kids to Boston Common and the Public Garden. They'll love the story of the bronzed statues of Mrs. Mallard and her eight ducklings - a tribute to Robert McCloskey's "Make Way for Ducklings," about a duck family who found their home in the Public Garden. Slowly but surely the Freedom Trail in Boston has become one of the 'must-see' things to do in Boston. It's not long, it's not full of bright lights and extravagant rides and excitement, but it is rather inspiring and quietly moving. Check Cheaprooms.com and get yourself to Boston with a cheap hotel packageand enjoy a weekend break in one of America's most historic cities. Boston can be cold in winter and the Freedom Trail is an outdoor activity, so do rug up, and check the weather forecast for Boston before you come so you know what to pack for. 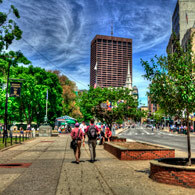 Find cheap accommodation in Boston and get ready to enjoy all there is in this cultured city. The Freedom Trail is a mere two and half miles long but it packs in 16 historically significant sites you should avail yourself of if you're a student of American history. The idea itself is quite cute - you follow a red brick pathway through downtown Boston and stop off each site as you go. The walk starts at Boston Common and takes you to USS Constitution in Charlestown. Markers long the way explain the events that took place there and you'll see graveyards, historic churches and other significant sites and buildings. 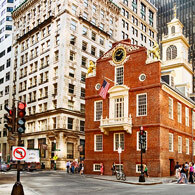 The sites include; Old South Meeting House, Old State House, and Paul Revere House and these, in particular, are worth paying the small entry fee to make yourself even more acquainted with a revolutionary period of American history. You'll be familiar with many of the names; including the Park Street Church, the Granary Burying Ground, the King's Chapel, Benjamin Franklin statue and site of the first public school in America, the Old Corner Bookstore, Old State House, site of the Boston Massacre, Faneuil Hall and Bunker Hill. It's been a few years, but Cheers was a happy, friendly place and appeared a great bar to hang out in. What's happening in Boston these days? 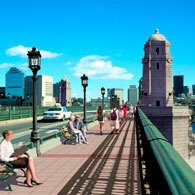 Go to Cheaprooms.com and get yourself to Boston with a cheap hotel packageto suit your budget and preferred locale. There's plenty to see apart from the local bars and restaurants. Consider the Freedom Trail for a start, and why not explore toney Beacon Hill while you're here. But check the weather forecast for Boston before you come so you know what you're in for. Find somecheap accommodation in Boston and get ready to enjoy Boston's best bars and restaurants. If you love history, there's plenty of it on the Freedom Trail in Boston. And happily it's close to many great bars and restaurants. Start your gourmet tour of bars at Sanctuary in the Quincy Market area. There's a load of ye olde authentic Irish bars in the area and Sanctuary is a stylish reprieve from sawdust and Guinness. MKT is a swish joint in the Financial District with low ceilings, chunky, comfy chairs and lounges and a hip vibe. Find it at Broad and Water. Alibi is in an old jail (get it!) and is the house bar at the Liberty Hotel (oh, once more with the crime entendres, nice), and the furnishings and general jail-chic style add up to a memorable experience. Presumably nefarious activities and / or under age drinking will be dealt with harshly. The Bristol Lounge is in the Four Seasons Hotel on Boylston Street. It's rather swish so needs your Sunday best, but it's fun and the staff are very welcoming. The City Bar is in the Lennox Hotel on Exeter St and is a bit more homey - if your home has hundreds of bottle lining the bar shelves with a glorious red hue coloring everything, with stylish bar stools lining the bar and lots of leather couches. It's fun.